"Sirup" redirects here. For 1990 drama film, see Sirup (film). For other uses, see Syrup (disambiguation). In cooking, a syrup or sirup (from Arabic: شراب‎; sharāb, beverage, wine and Latin: sirupus) is a condiment that is a thick, viscous liquid consisting primarily of a solution of sugar in water, containing a large amount of dissolved sugars but showing little tendency to deposit crystals. Its consistency is similar to that of molasses. The viscosity arises from the multiple hydrogen bonds between the dissolved sugar, which has many hydroxyl (OH) groups. Syrups can be made by dissolving sugar in water or by reducing naturally sweet juices such as cane juice, sorghum juice, maple sap or agave nectar. Corn syrup is made from corn starch using an enzymatic process that converts it to sugars. Simple syrup is a basic sugar-and-water syrup used by bartenders as a sweetener to make cocktails. Simple syrup is made by stirring granulated sugar into hot water in a saucepan until the sugar is dissolved and then cooling the solution. The ratio of sugar to water is 1:1 by volume for normal simple syrup, but can get up to 2:1 for rich simple syrup. For pure sucrose the saturation limit is about 5:4 by volume. Syrup can be used as a sweetener. Combining Demerara sugar, a type of natural brown sugar, with water produces Demerara syrup. Sugar substitutes such as honey or agave nectar can also be used to make syrups. Flavoured syrups are made by infusing simple syrups with flavouring agents during the cooking process. A wide variety of flavouring agents can be used, often in combination with each other, such as herbs (rosemary), spices (chipotle chilis; cardamom), or aromatics (orange peel; lemongrass; ginger). For instance, syrupus aromaticus is prepared by adding certain quantities of orange flavouring and cinnamon water to simple syrup. 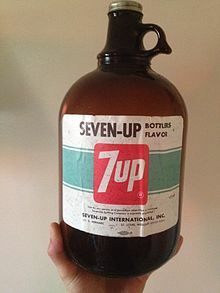 This type of syrup is commonly used at coffee bars, especially in the United States, to make flavoured drinks. Infused simple syrups can be used to create desserts, or, to add sweetness and depth of flavour to cocktails. Gomme syrup (or gum syrup; gomme is French for "gum") is an ingredient commonly used in mixed drinks. It is also commonly used as a sweetener for iced coffee in Japan. Like bar syrups, it is a 2:1 sugar and water mixture, but has an added ingredient of gum arabic. Gomme syrup is made with the highest ratio of sugar to water possible, while the gum arabic prevents the sugar from crystallizing and adds a smooth texture. ^ Tyler James Wiltgen (August 2007). "An Economic History of the United States Sugar Program" (PDF). Archived (PDF) from the original on 2015-02-09. Masters thesis. ^ "U.S. Sugar Policy". SugarCane.org. Archived from the original on 2015-02-11. Retrieved 2015-02-11. ^ "Corn Production/Value". Allcountries.org. Archived from the original on 2010-10-25. Retrieved 2010-11-06. ^ Dietsch, Michael. "Cocktail 101: How to Make Simple Syrup". Serious Eats. Retrieved 1 July 2018. "Syrup" . Encyclopædia Britannica (11th ed.). 1911.